Winners of Wildlife Forever's State-Fish Art Contest and their families assembled in Athens, Texas, June 24 and 25 at the Texas Freshwater Fisheries Center to be honored for their winning artwork. A total of 31 states were represented by the attending children who were winners of their individual states. Adding to the overall excitment was the discovery of whose fish art won the coveted National Awards chosen from all the winning entries. The award structure has been reconfigured to reflect the addition of two new top honors to be presented annually. The Seth Thomas Spradlin Best of Show Award is now the top honor, given to one piece selected as "best of the best" from all winning entries. It is dedicated to and given in recognition of the extraordinary talent and conservation ethic of the 2008 top artist, who lost his life in a bush plane accident in Alaska in August of 2010. 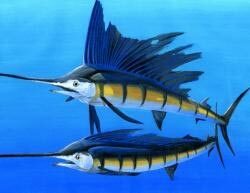 The first ever recipent of this award was Brady King of Livingston, Texas with his stunning painting "Two Atlantic sailfish". The second honor presented for the first time this year, was the Smile Award given to a painting selected from all the contest entries that "makes you feel good inside when you see it. You just can't help but smile!" Amy Wang, a 4th grader from Lilburn, Georgia, was the "first ever" winner with her joyful painting of two cutthroat trout "Crossing in the Sun." Another young artist to discover he was one of the top award winners was Justas Varpucanskis a 7th grader from Modena, Illinois. Justas' painting of a largemouth bass titled "A Leap of Faith" was the 2011 winner of the Art of Conservation? Stamp Award. "Wildlife Forever is pleased to honor the talented Illinois artist, Justas Varpucanskis with the 2011 Art of Conservation? Stamp Award," said Douglas H. Grann, Wildlife Forever president and CEO. "This honor is awarded to the student whose winning design becomes part of the State-Fish Art Stamp Collection. By recognizing the work of students today, we hope to inspire the conservationists of tomorrow." Justas' painting is available as a collector's stamp. Both as a single stamp and a souvenir sheet. Proceeds from sales of the stamp helps fund the State-Fish Art Contest and Wildlife Forever conservation projects. Both versions of this year's, and past years, stamps can be purchased in Wildlife Forever's online store. Liane Du of Markham, a young artist from our partner Ontario, Canada, took the People's Choice Award. Voting by the public took place both online on PhotoScramble and at the Texas Freshwater Fisheries Center prior to the awards ceremony. Over 71.000 total votes were cast in the wild and wooly contest for this national award! National first, second and third place STATE-FISH ART awards were given in each of three grade-level divisions. Top Honors for the NATIONAL AWARD in grades 4-6 division went to Winnie Li of Massachusetts with her colored pencil drawing "The Atlantic Cod.". Second place went to Emily Jiang of Michigan and third place was won by Joyce Kim of Oregon. Justas Varpucanskis of Illinois, the winner of the Art of Conservation Stamp, also took first place for the NATIONAL AWARD in grades 7-9. The second place winner was Brock Jenkins of Missouri, with his oil painting "Magestic,"and the third place win went to Jonathan Tufele of Utah. The grades 10-12 NATIONAL AWARD honors went to Dingling "Sunny" Zhong of Arkansas. Second place was awarded to Christine Clayton of Ohio. GiGi Barker of Texas received third place. All 110 state and international winners from 45 states, Canada, Indonesia and Turkey can be viewed at www.statefishart.org. The winning artworks are for sale on a variety of products and formats including business cards, shirts and posters at the Wildlife Forever fundraising store on Zazzle. Purchases support the Contest and children's outdoor education. The Wildlife Forever State-Fish Art Contest seeks to involve students in the outdoors through art. Students compete in three grade-level divisions: 4-6, 7-9 and 10-12. Deadline for submitting entries to the contest is March 31 each year. Information on the contest is available at: www.statefishart.org. Wildlife Forever is America's leading all species conservation organization, conserving America's fish and wildlife through education, preservation of habitat and management of all things wild. Learn more at the Wildlife Forever web site.